Bring the magic home with these Winnie the Pooh wall decals. 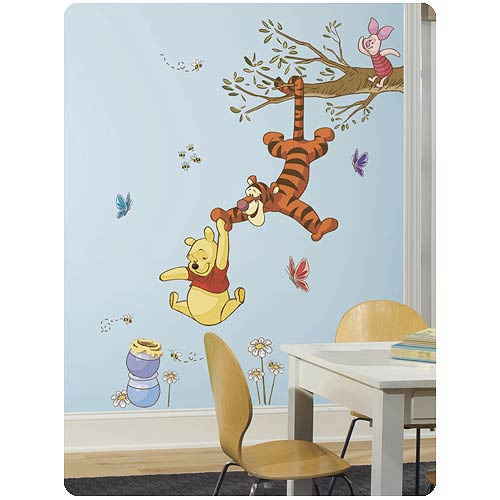 Decorate your child's nursery or bedroom with Winnie the Pooh, Tigger, and Piglet swinging for honey. These removable decals are easy to install: simply remove from the backing and assemble on any smooth, flat surface. And each element can be removed, repositioned, and re-applied multiple times without damage or residue on your walls. A great finishing touch for any Pooh and Friends themed bedroom! Decal measures 52-inches tall x 41 1/4-inches wide. Ages 4 and up.